To accompany the photogravures, I am pleased to present the Astra Velum Limited Edition Artist Book. I’ve collaborated with author Gina Ochsner (whose writings have garnered Guggenheim and NEA grants, as well as the Flannery O’Connor Prize and Oregon Book Award, and are published in The New Yorker, Tin House, Glimmertrain and the Kenyon Review), who wrote a poignant essay to accompany the work. I’ve also worked closely with award-winning bookmaker Rory Sparks. Together, we’ve created more than just another book of text and photographs, but a work of art in itself. The way the book shimmers in the light, the depth of text embedded in the page, the richness of the images…it’s something that feels solid in your hands, but also moves deep into your heart. The Astra Velum series has been featured by National Geographic, awarded the Critical Mass Top 50 award, Grand Prize at the Lishui Photography Festival in China, published in numerous magazines, shown internationally, and added to national collections including the Museum of Fine Arts Houston, Yale University Library Collection, Haggerty Museum of Art, Griffin Museum of Photography, and the Scripps Collection. The book is limited to an edition of only 25 copies. You can also purchase the book with the inclusion of a photogravure print. See below for more information. The Astra Velum limited edition artist book combines superb archival prints of 19 Astra Velum images, with an essay by award-winning author Gina Ochsner. It is hardbound in a custom Cave paper reflecting the celestial theme of the series. Designed by the artist, the book is lovingly handcrafted by acclaimed bookmaker Rory Sparks. Picking up the book, the first thing a viewer notices is the cover’s rich handmade paper embedded with mica, custom made for us by Cave Papers. It shimmers like stars in the night sky as it turns in the hand. The book’s substantial thickness and heft harken back to old world craftsmanship. Opening the book, one notices the double-thickness pages, which open to lay flat. Each spread features one of the award-winning images from the Astra Velum series, stunningly printed on archival cotton-rag paper. Gina Ochsner’s essay In Praise of Pigmentation opens the book. It’s a poignant accompaniment to the work, written by someone with her own history with freckled and flawed skin. In her inimitable and intimate way, she wrestles with the question: In a world that flaunts flawlessness as the ideal, can we find beauty in the blemishes? Letterpress printed, the essay is deeply embossed into the thick Crane Lettra paper. The book also includes an introduction by the artist, and a colophon numbered and signed by the artist. 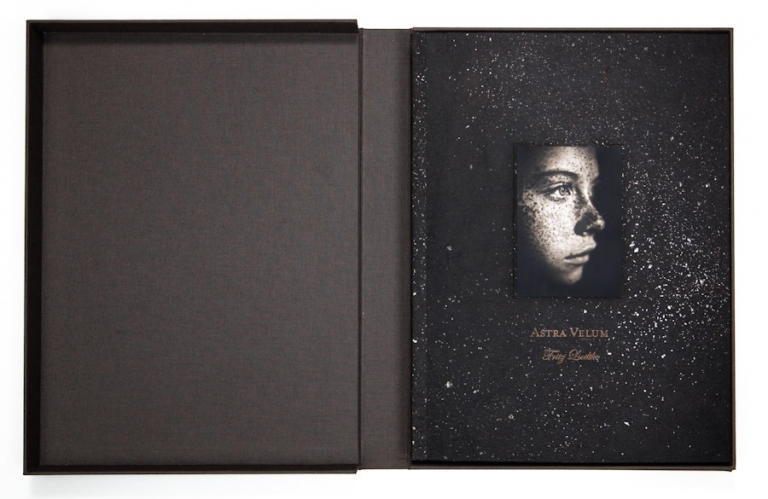 The limited edition Astra Velum artist book is offered at $995. Only 3 copies remain. Purchase this option. The limited edition book, accompanied by a limited-edition photogravure print of your choice, is offered at only $1795. Purchase this option. To place your order, simply click the above Purchase links, or contact us directly at (503) 267-5078, or fritz(at)fritzphoto.com. If you’d like to view the book, it is currently available in Boston at Panopticon Gallery, in Portland at 23 Sandy Gallery, and in Santa Fe at PhotoEye. You’re also welcome to come by the studio in Portland and view it in person; contact me to schedule a time. *Educational institutions are offered a 10% discount on their purchase. *Receive the book free with your purchase of the limited edition Astra Velum Portfolio of original photogravure prints. These prints have been described by Melanie McWhorter of Photo-Eye Books as “lovely, luminescent, one-of-a-kind prints [which] must be seen to be appreciated.” Susan Burnstine, in Black & White Magazine says, “Fritz Liedtke’s stunning photogravure portfolio Astra Velum is a remarkable achievement.” Please inquire for more information. Download a PDF of the complete prospectus: Astra Velum Limited Edition Book Prospectus.